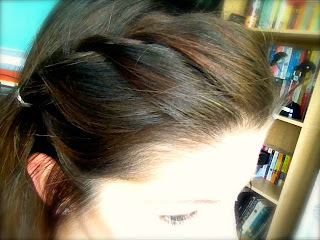 I don't know about you but I absolutely LOVE the french braid bang / headband look... Only problem? I can't french braid FOR CRAP! No matter how hard I try it always looks like a train wreak. For those of you not sure what I'm referring to please see the picture below. This style seen on Lauren Conrad many a time along with a lot of A list celebs. Now that we're on the same page (I know we haven't left this page yet... hardy har har) Instead of continuing to spend countless hours standing in my bathroom trying to french braid my hair and ending up with a knotted mess or a pile of hair on the floor from the tangles I decided it was time to find a simpler route. ROPE BRAID TO THE RESUCE!! This truly very simple braid takes two strands and pretty much just twists the hair in creating a very fun and pretty look that is much simpler than its evil cousin the french braid. If you guys try it out I'd love to see your results! Please share them on my Facebook page or Tweet them to me! This looks really nice, great job!